This recipe is from a blog that I read (According to Kelly). It's super easy & kid friendly! 1. 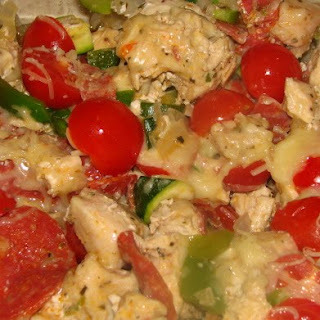 In a large bowl, combine everything except the tomatoes and cheese. 3. Place 1/4 of the mixture in the center of each piece & fold foil round mixture and seal tightly. 4. Grill, covered. over medium-high heat for 15-18 minutes or until chicken is no longer pink. 5. carefully open each packet. sprinkle with tomatoes and cheese. seal loosely, grill for 2 more additional minutes (or until cheese is melted).